Ravens have wingspans just over 4′. Their longs tails are wedge shaped in flight. They have elongated pointy feathers called hackles on their necks. Ravens have large, curved bills partially covered with feathers. The plumage is black with a glossy bluish- purple sheen. Their legs, feet, and bills are also black. Many different types, including open woodlands, rocky mountain areas, coastal, river, desert, and plains habitats. Throughout most of the Northern Hemisphere. Ravens are mainly scavengers, and eat a wide variety of plant and animal matter, including small rodents, lizards, frogs, mollusks, insects, seeds, wild fruits, nestlings, and eggs of other birds. They will hide, or cache, their food supplies. Ravens nest in rocky cliffs or tall trees. Their nests are bulky structures, 2-4′ in diameter constructed of twigs and branches and lined with grasses, moss and fur. Females lay eggs from mid-February to late May. Females incubate three to seven eggs for three weeks while the male feeds her. Both parents feed the young. The offspring fledge at five to six weeks. Fledglings stay with the parents for six months. The common raven had nearly disappeared from the northeastern United States in the early part of the 20th century. Now ravens are reoccupying much of their former range. They are still listed as endangered or threatened in a number of states because of the small populations. ​The raven is the largest species of songbird. They are very intelligent birds, and seem to apply reasoning to new situations. They remain paired all year and perhaps for life. Ravens are expert fliers, and engage in acrobatic flight displays with rolls, somersaults and dives during breeding season. They have also been observed flying upside down. 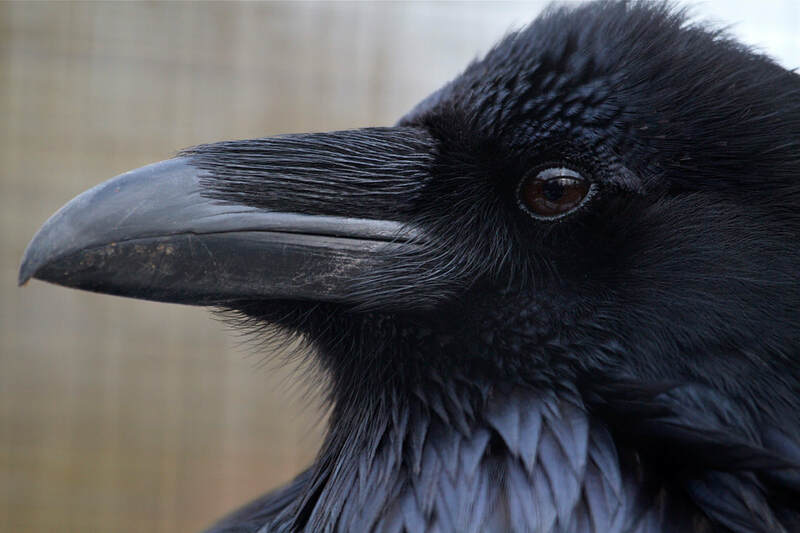 Come see our common raven in the New England Farmyard. His exhibit is filled with more toys that most playrooms! He can be observed hiding his food everywhere in his exhibit. This intelligent bird is also a beauty, with a thick “shaggy” neck, a large curved bill, and beautiful glossy black plumage that has bluish-purple sheen. The raven has often played important roles in culture, mythology, and literature.